The UL60 Ultralight Stand Bag is lightweight with an integrated grip handle for easy lifting. This is a high performance golf bag with quick release leg action. 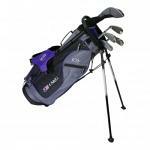 This is the perfect golf bag for any aspiring junior golfer who wants to look stylish on the golf course.